Ricoh is one of the world’s largest manufacturers of copiers, fax systems and printers. 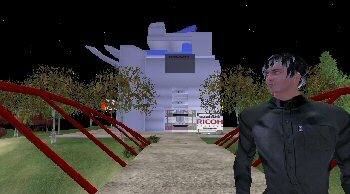 Our Second Life build for them is a three storey high replica of an Aficio photocopier housing a showroom with working replicas of their latest photocopiers. We’ve been dealing with the Belgian subsidiary who used the facility for a launch presentation to dealers. One employee went into the showroom and big-screened to the real-life gathering. This is an approach that minimises the risks inherent in bringing all the dealers into Second Life as ‘newbs’. It has less impact also, but the company now has the ability to manageably host those dealers who have an interest. Thanks to principal builders Lucius Templar and Hasu Kuramoto, whose attention to detail left the client completely delighted.